Copper Chef Reviews - The Right Non-Stick Pan For You? Copper Chef cookware is infused with 100% real copper for the ultimate in heat conductivity and distribution, as well as a Cerami-Tech non-stick coating. Endorsed by Eric Theiss, Copper Chef is a 6-in-1 non-stick, no cleanup pan that works as a roasting pan, rice cooker, steamer, stock pot, wok, and baking dish. On top of this, the high-quality pan features induction plate channels that heat up quickly and reduce hot spots, and also allow it to work on all stovetops, whether electric, gas, ceramic, or induction. Moving Copper Chef around will be easy too, thanks to its riveted handles and helper handle, and you won’t have to worry about your family’s health since the non-stick coating is PTFE and PFOA free and won’t chip, peel, or flake into your food. Then, once you’re finished using the pan, it’s dishwasher safe so cleanup is a snap. 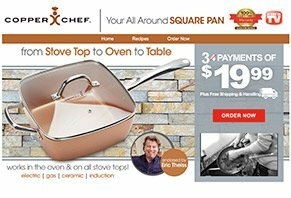 This is one featured filled pan but will it really help you cook easier and healthier, or is it just priced as high as a meal cooked by a 5-star chef? There are a lot of points to address about this pan, so let’s start by looking at copper as a cooking material. Is Copper a Good Cooking Material? What Are Some Pros & Cons? Arguably the biggest benefit of copper cookware is that it comes with “excellent thermal conductivity.” If you’re not a chef, this just means that copper pans tend to heat evenly, without hot spots, and the level of heat changes almost instantly along with your burner. Plus, there’s no denying that copper cookware looks great. But copper cookware isn’t perfect. It is a highly reactive material (which is why it’s so great at conducting heat), especially for “alkaline or acidic foods, which can take on a metallic taste after being cooked.” In other words, you’ll be ingesting copper. Copper pots and pans are also some of the most expensive cookware you can purchase. They’re labor-intensive, and will eventually corrode if they’re not thoroughly cleaned and dried after each use (although Copper Chef’s non-stick coating might alleviate some of this, which we’ll come back to next). Finally, remember that all copper cookware is either lined with tin or stainless steel, the latter being the preferred material due to its longevity. Unfortunately, we’re not told which material Copper Chef contains. Now that you know more about the pros and cons of copper cookware, let’s take a closer look at the cookware’s non-stick coating. What is Cerami-Tech Non-Stick Technology? Non-stick cookware has been around for years (pretty much due to the invention of Teflon), although recently, manufacturers have stopped including this specific chemical since it contains Polytetrafluoroethylene (PTFE). The problem is that, once heated to around 260 degrees, PTFE begins deteriorating and completely decomposes at temperatures above 350 degrees. Once it’s airborne and inhaled, it can cause flu-like symptoms. Similarly, perfluorooctanoic acid (PFOA) is another non-stick coating that is no longer used for the most part, since ingestion can damage hormone levels and liver function, attack the immune system, and can even lead to cancer. Here’s the catch: While it’s positive that Copper Chef’s non-stick coating doesn’t contain these chemicals, there’s essentially nothing online about Cerami-Tech, other than this brochure for a “high performance solvent free coating designed for use as a resurfacing and lining system to improve the efficiency in fluid flow environments”—which we don’t think has any relation to what’s contained in Copper Chef. So ultimately, we know very little about the coating. The company tells us the new Copper Chef XL Pan delivers many of the same features as the original, including a PTFE and PFOA-free Cerami-Tech coating, heat resistance up to 850°, 5-layer construction, and heavy-duty design. According to the company, the XL version also features a stainless steel induction plate that works in the oven and all stovetops, including electric, gas, ceramic, and induction. Finally, like the original, we’re told that the XL is a 6-in-1 pan that allows you to prep, cook, and serve in one large capacity family-size pan, while replacing your stock pot, rice cooker, frying pan, roasting pan, wok, and baking dish. Given all of this, what’s the main difference between the original and the new XL Pan? Basically, XL’s sides are higher than the original, which the company claims provide 25% more room to cook food. Pro tip: However, keep in mind that, because this is a vertical increase in space (versus horizontal), the XL only increases the volume of the food you’re able to cook at one time—not the surface area. In other words, XL’s higher sides might come in handy if you’re boiling liquids, frying, or cooking things like rice, pasta, soup/stew, etc. However, the Copper Chef XL Pan won’t provide an additional cooking surface to prepare things like meats, pancakes, and so forth. How Much Does The Copper Chef Cost? You’ll also receive a free recipe book containing over 25 recipes, as well as a lifetime guarantee, less S&H charges. In addition to these packages, you’ll also get to choose one of three different bonuses when ordering Copper Chef XL, including the Perfect Rice Cooker, Micro Knife, or Perfect Slicer. In order to make good on this guarantee, you’ll need to call Tristar Products customer service at 973-287-5176. But what about Copper Chef’s manufacturer? Do they have a reputation for quality products? The non-stick pans are brought to you by Fusion Life Brands, who also makes the Fusion Xcelerator and Fusion Juicer. Fusion Life Brands, in turn, is a division of Tristar Products, one of the biggest ASOTV companies in existence. In fact, they’re second only to Telebrands. As such a large company, Tristar is responsible for some hugely popular products, including Clear TV, Copper Wear, Perfecter Fusion Styler, Power Pressure Cooker XL (more about this in a second), and many more. Between all these products, they have an average rating of 2 stars, based on well over 1,300 HighYa reader reviews. Here, common complaints tend to revolve around less-than-stellar quality and customer service, as well as products that don’t work as advertised. Eric Theiss has been cooking since he received his first cookbook at age 6 and has spent time working in high-end NYC restaurants, earning his wings under chef Frank Falcinelli. Over the last several years, however, Eric has been working with QVC performing live, on-air culinary product sales. Eric was even the host of Tristar’s Power Pressure Cooker XL 30-minute infomercial! But here’s the thing: Just because Mr. Theiss is endorsing the product, this doesn’t necessarily mean that he uses it. In fact, as a professional chef, it’s much more likely that he uses some high-end copper cookware from another manufacturer (again, as we noted in the previous section, ASOTV products don’t exactly have reputations for high quality). So, while Eric’s endorsed certainly puts some star power behind Copper Chef, we don’t think this should weigh heavily on your purchasing decision. Should You Buy Copper Chef? Taking everything we’ve learned here, we don’t think there’s necessarily anything unique about Copper Chef that you wouldn’t find at a local home goods store. In fact, if you do a quick online search for “copper non-stick cookware,” you’ll find that you can purchase entire copper cookware sets (multiple pots and pans) for not much more than this pan. And although Copper Chef’s non-stick surface can help you cook with less butter and oil, unless you’re also cutting back on unhealthy ingredients in your food itself, this probably won’t do much for your health. And while the XL’s higher sides could definitely come in handy, depending on what you’re cooking, keep in mind that it certainly isn’t unique. In fact, we’ve reviewed several other nearly identical options here at HighYa like Red Copper Square Pan, Gotham Steel Square Pan, and Square Copper Pan Pro. Item is on back order and I have no idea when they will get more. I'm not too impressed with this advertisement being it was on TV. If they are out of inventory during the holiday season don't you think they should not advertise it on TV? Wrong. I'm really not happy with this. They're going to get a lot of cancellations. It is just too bad that I believe that the actual product is what needs to be reviewed. Thanks for nothing Melinda. You are reviewing the item without the item? No one can review the product as they've never received it. I think reviewing the customer service is valid. We tried to order this after watching a TV Promo. It said free shipping. It didn't say anything about not shipping to Alaska. I tried to do it online. No go. So, we tried calling. We explained our trying to order online and it's not going through. Then after taking all of our info, including credit card numbers, she said, "sorry, we don't ship to Alaska". She should have been able to say that right off. But no, she said she needed all of our info first. Scam! Buyer beware! I can't really rate this product. I never received the copper pan I ordered a month ago. I tried to write to the company but their email address at "copperchef.com" is not a valid address. Buyer beware. I plan to contact the Better Business Bureau if i do not get a response soon. Copperchef.com worked fine for me. Took me right to the site. Looks and feels like a scam, or worse. We too made our purchase for this from their TV promo. After several days I was able to 'track' my order. But the tracking return info showed they were out of stock and we should allow 2 to 3 weeks. I just now got an update on our order: it has been canceled. I did not cancel but I'm not disappointed. Will not order again and will not recommend to friends. I placed an order that was later canceled. I ordered the Copper Chef and was charged for the two sets and a smaller pan on December 14th. I just received an email on January 1 informing me that the Items are not available and my order was canceled. The email said I would not be charged but they already had my money since December 14th. Thanks for your honest comment, I was going to order one because it looked great, but after reading what you went through, I'm changing my mind. Thanks again. I ordered the pan using the phone order line. Do not do this. I was on the phone while the recorded announcement tried to up sell me for everything from more pan sets to Walmart cards to vacations. I was unable to simply complete the order until all of this up selling was done, which took quite a bit of time. Hope the pan is better than the order line. I am already beginning to think it will go back immediately or be canceled. It's a darn fraud. They did the same - they charge my card $241. Never got the package they sent and no Walmart gift card thing. I called them, now they can't find my info anywhere. So people be careful, they will take your money and you get a bunch of trash instead of your order. Reporting them to BBB. Worst customer service EVER. Product has been on backorder for a while and company does not answer e-mail. I called (got overseas person) and still was told that product on back order, yet they continue advertising on TV. I am canceling my order. Did not receive it yet. I ordered my Copper Chef Pan on November 30, 2015. I have contacted the company twice and was told this was on back order. I talked to a representative after being on hold for 12 to 15 minutes. I was told I should receive my pans in 10 to 14 days after the fourth of January. We'll see. Good thing this was not a Christmas present. I think they should have told me at time of ordering they were backlogged. If not received, I will also complain to the Better Business Bureau. I just called to order the Copper Chef. I saw it advertised for three payments of 19.99 and this men told me that it was three payments of 24.99. I told him that was not what I was seeing and he said too bad. I asked to talk to a manger and he told me no. He was very nasty, so I hung up the phone. This company must be B.S. I tried chatting with them on the website to find out how many quarts the pan is. They won't tell you. Just that it is 9 1/2 inches. He said he can't provide false information. He said as long as the food fits in pan you can cook it, well duh who sells a pan and can't tell you how big it is. Glad i didn't buy this. [21:36] Thank you for visiting chat! We will be with you shortly. [21:37] Chris: One moment please. [21:40] Chris: We do not have information about the quarts. [21:41] Larry: how do you sell a pan and not know how many quarts it holds? [21:43] Chris: You can cook your food as long as it will fit on the Copper Chef. We do not have the exact information about how many quarts the pan can hold, we do not want to provide you with any false information. [21:44] Chris: Is there anything else I can assist you with? [21:45] Larry: I have never heard of that. Any pan I have ever bought, single or as a set tells me what's included. Like a 2 qt pan, 3 qt pan, 5 qt dutch oven, etc. I ordered this pan on January 4th, got a confirmation email stating they got my order and validation of payment and stated that would send another email confirming shipment. My bank verified payment two days later, I still have not received an "item shipped" email. Numerous emails to their customer service have gone unanswered, two "order status" checks revealed two different results. The first one said “order shipped”, the second (three days later) said: “out of stock, temporarily backordered, wait 2 to 3 weeks” I'll never but anything from this company again and am seeing if I can bring legal action if I don't receive my order or a refund. Write a Review for Copper Chef!